Meet the clique that rules Fidelity High: Olivia, Zelda, Nordica, and Shelly, each one handpicked by über-popular Hamilton Best. You know you're "in" when you make the guest list for one of Hamilton's parties. And in the thralls of senior year, everyone wants to get noticed by Hamilton. But Hamilton's elite entourage is coming apart at the seams. Olivia fantasizes about finally having a boyfriend, Zelda dreams of ditching high school, Nordica wants to be alone with her photography, and Shelly's plotting to dethrone Hamilton. Lies and secrets are ripping away the careful ties that have kept them together for years. But Hamilton has the biggest secret of all, one that only her boyfriend Alex knows. If the truth got out, it would shock everyone and destroy Hamilton's fragile world—and she'll do anything to protect her secret and keep her clique together. Seriously, this book is mindbendingly awesome! Definitely check it out! 1. In POPULAR, you alternate POVs, letting the reader get to know each of the five members of the clique. How did you make each one so distinct? Was it hard to get each voice right? In a word, revision. It took some rewrites to get everything straight, and this may sound strange but going back and reading what I had written helped me to get to know the characters a little bit better. Olivia is my favorite because I love her attitude, and I had the easiest time writing her chapters. In high school, though, I was probably more like Nordica. I very shy, and not involved in the social scene at all. 3. Can you describe your path to publication? POPULAR was a slush file find. I submitted it directly to Flux without the benefit of an agent. That submission was something of a whim for me. I had this manuscript that I wasn't sure what to do with, and I stumpled upon the Flux website so decided to take a chance. I'm glad I did! 4. 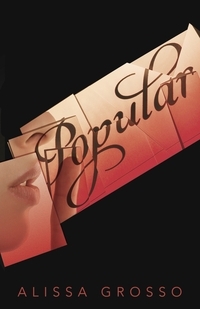 How long did it take you to write POPULAR? How long to revise? Are you a plotter or pantser? A LONG time. Over 10 years, but I don't want that to scare any would-be writers. I wasn't working on the book that whole time. It was very much an on again, off again thing for me. I haven't made up my mind as to whether I'm a plotter or a pantser. With Popular I was pretty much a pantser, but with other projects I've worked on, I've found that I needed an outline to keep me on track. My second novel is tentatively scheduled for publication in 2012. It's another contemporary YA novel that will be published by Flux, but otherwise it is completely different from Popular. It's presently titled FEROCITY SUMMER. 6. Can you describe a typical writing day for you? There is no such thing as a typical writing day for me. There is no such thing as a typical day for me, period. To tell you the truth, I kind of like it that way. Anyway, writing usually gets done at night because that's when I think the clearest, and when there seem to be the least distractions. The only problem is, if it's been a particularly busy day, I'm liable to fall asleep after typing only a sentence or two. 7. Do you have any critique partners? If so, how did you find them? I don't presently have any critique partners, but I've belonged to critique groups in the past both in-person and online, though even the in-person groups I learned about online. A good critique group can help you not only by providing suggestions for improving your own work, but by teaching you how to critique works by fellow members, a skill that you can later use to revise your own manuscripts. 8. Here's my Apocalypse Type question: If you knew the entire planet was going to explode in a few hours, what would you want to have as your last meal? Pizza, but allow me to clarify, I am talking about good New Jersey Pizza and not that strange stuff that those chain restaurants call pizza or that they serve in pizza parlors in places other than the Garden State (with the exception of a few New York pizza purveyors). Also since this meal would likely be shared with a special someone in my life, it would also include an order of mozzarella sticks. Oh, and for dessert a vanilla cream-filled donut and a nice, big mug of Earl Grey tea. POPULAR sounds great! Can't wait to read it, and so glad that now I don't have to. Congrats!